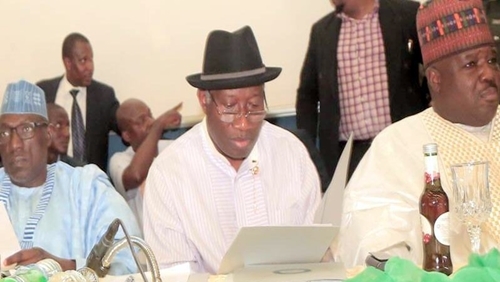 Former President Goodluck Jonathan said Nigerians still believed in the capacity of the Peoples Democratic Party to lead the country at the expanded National Caucus of the party held on Monday night in Abuja. Members of the National Expanded Caucus of the Peoples Democratic Party (PDP) met in Abuja on Monday night and vowed to rebuild the party ahead of the 2019 elections, saying that there was the need to rebuild the party in order to accommodate those that would be joining it from other political parties. According to Punch newspaper, the meeting was one out of the three to be held by three different organs of the party as its prepares to fix a date for its national convention. It was the first gathering of members of the party since the Supreme Court sacked the Senator Ali Modu Sheriff-led national working committee on Wednesday. Some leaders of the party, who spoke at the Monday’s meeting included the Chairman of the party’s National Caretaker Committee, Makarfi; former President Goodluck Jonathan; and the Governor of Ekiti State and Chairman of the PDP Governors’ Forum, Mr. Ayodele Fayose. Jonathan told the gathering, which included Deputy President of the Senate, Ike Ekweremadu; a former President of the Senate, David Mark; and governors of Rivers, Taraba, Akwa Ibom, Delta, Gombe states that a strong party would attract the people. The former President insisted that the PDP remains what he described as the largest party that could unite the country. He described Monday as a day of joy, adding that his presence was to appreciate members of the PDP, adding that the party passed through some challenges and came out of them peacefully. Jonathan commended the members of the NCC who he said remained resolute by standing through the storm, and also commended the youths who used the social media to promote the ideals of the party. In his remarks, Makarfi commended the members of the party for “being unyielding in their faith on the judicial system”, and said members of other political parties were already planning to defect to the PDP, but said he would not mention their names and where they would be coming from. “This hall will not contain us by the time they start to come back to the PDP. I will not tell you who they are or where they are,” the former governor of Kaduna State said. Also speaking at the meeting, Fayose said that the APC must die in order for the PDP to live. He appealed to members of the party to go back to their states and regain the confidence of their constituencies ahead of the 2019 general elections. He said, “The APC must die so that the PDP can rise. Old change will give way for a new change. Now the coast is clear, all the party leaders should go home and work for the PDP. The meeting was well attended by senators, members of the House of Representatives, some former national officers of the party and former governors.